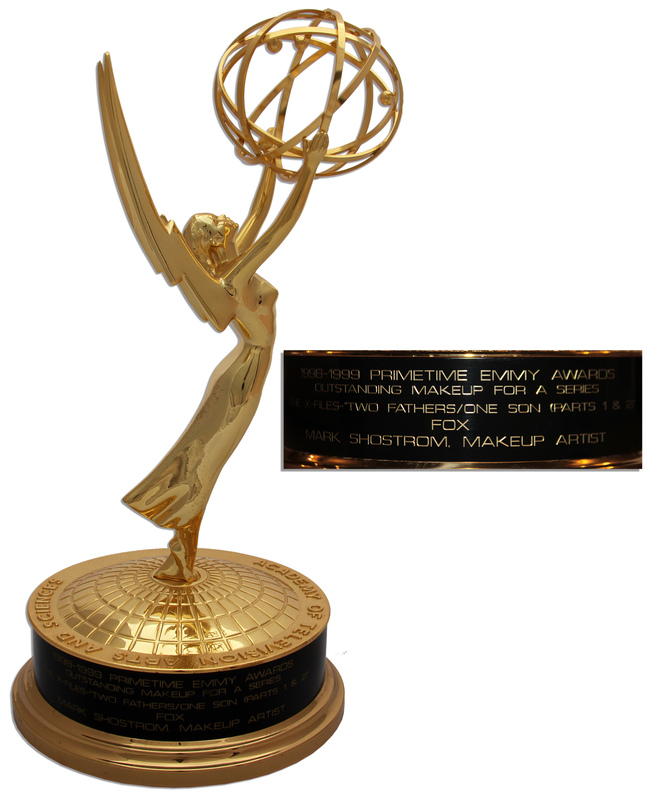 With 34 Oscars and hundreds of Emmys in our recent auctions, we’ve officially grasped the same statuettes in our hands that many Hollywood legends did the night they took home their awards. 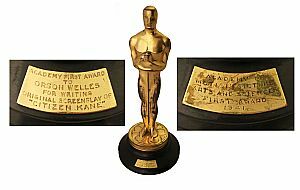 In December 2011, we auctioned the Oscar that Orson Welles won for “Citizen Kane” which sold for $861,542, in a record-breaking auction of 15 Oscars — the largest collection of Oscars ever sold — and which pulled in over 3 million dollars. Few can forget the famous opening line of Citizen Kane — that one simple dying word: “Rosebud” which Orson Welles penned himself in the original screenplay that won him this Academy Award for his original screenplay in 1942. Awarded by the Academy of Television Arts and Sciences, the first Emmy Awards were presented on January 25, 1949 at the Hollywood Athletic Club, back when primetime television was such a new medium that only three TV shows and performers took home the famous statue and just six awards in total were presented. Back then, there were only one million TV sets in the United States in total, with television still finding its footing to become the dominant medium that it has today. 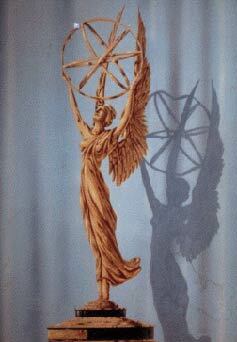 The design of the statue has remained tried and true, with the famous winged woman holding an atom. 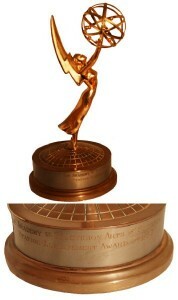 (The wings represent the muse of art; the atom the electron of science.) The TV Academy rejected a total of forty-seven proposals before settling on television engineer Louis McManus’ 1948 design, who used his wife as the model in the ultimate romantic gesture. 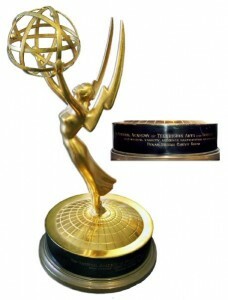 You always hear actors saying how the awards are “heavier than they look!” as they accept their awards. Carb-less fast-filled pre-award show diets aside, the actors are right. They are heavier than they look. Each statuette weighs in at just over six pounds and is made of copper, nickel, silver and gold, designed by the same company who manufactures the Oscars. 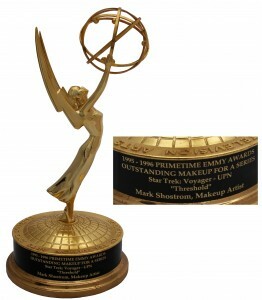 This beautiful and rare early Emmy award was awarded for station achievement in 1954. July 2012’s auction had three Emmys sold from popular television shows, with the Emmys for “The X-Files”, “Buffy The Vampire Slayer” and “Star Trek: Voyager” all being auctioned off. 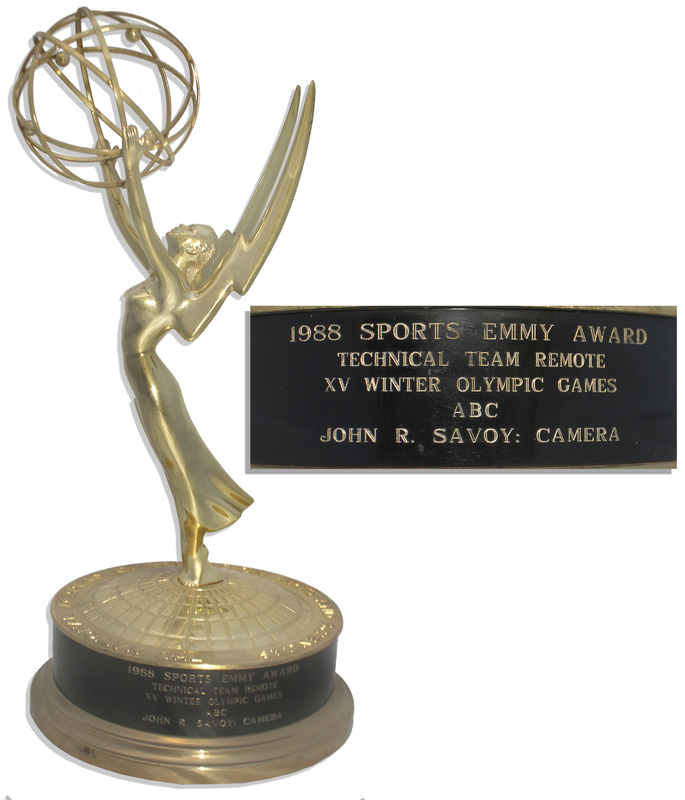 This Emmy was justly awarded to camera operator John Savoy, for his brave work during the 1989 Bay Area World Series, when an Earthquake struck during the telecast. A 1987-1988 daytime Emmy Award was being auctioned for hairstylist Zora Sloan for Outstanding Achievement in hairstyling for the long-running NBC drama series “Days of Our Lives.” Sold for $6,544. 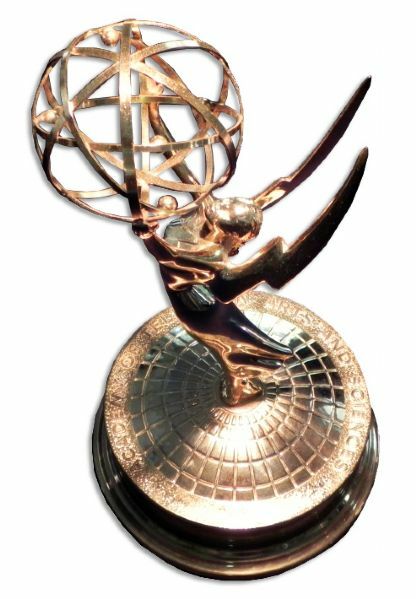 And last but not least, Unbeknownst to many, the Emmys are split and awarded to various sectors of television production throughout the year — from sports to regional news broadcasting to technology and engineering. 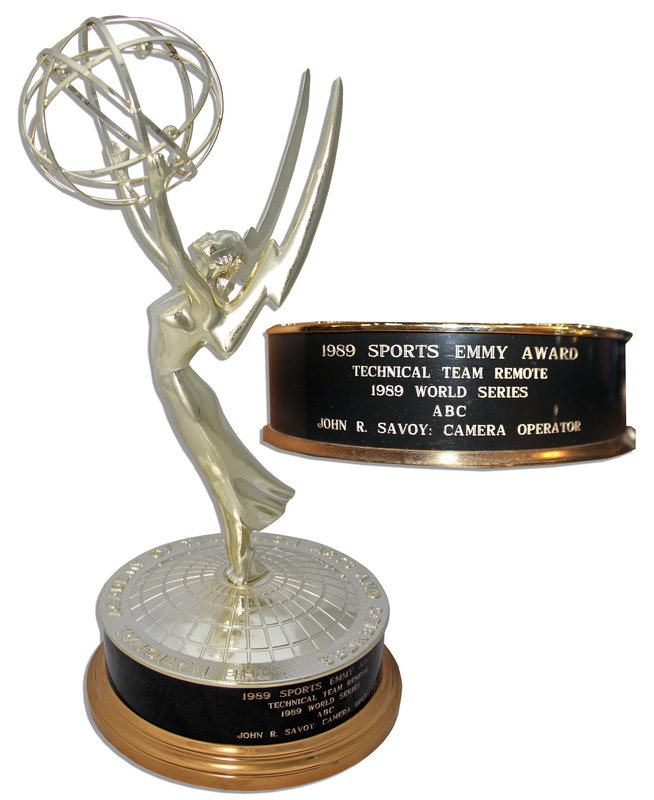 We had auctioned a rare 2002 Technical Award from the Technology & Engineering Emmys. 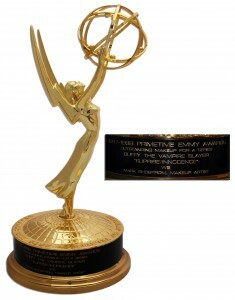 It sold for $5,948. 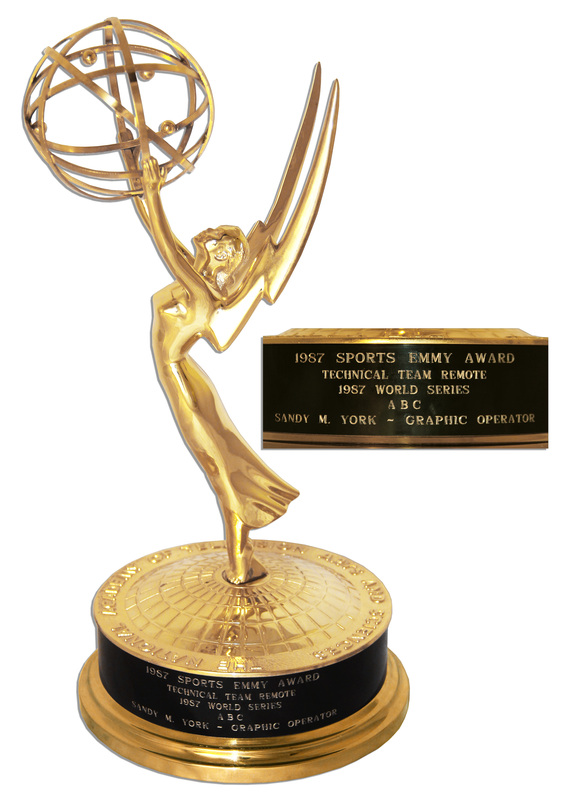 Though the earners of the awards may not necessarily be in front of the camera, these awards honor individuals and companies whose technical innovations impact the physical process of broadcasting television. 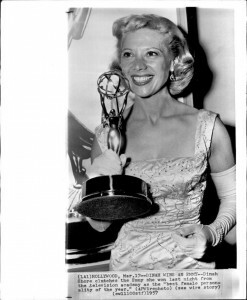 The wildly popular variety show became a spin-off of her original ”Dinah Shore Show” as Chevrolet Motor Division became the sponsor. The show aired from 1956-1963 as a live broadcast in NBC’s famed ”living color,” with the signature ”See the U.S.A. in Your Chevrolet” theme song sung by Shore. Shore performed alongside legends like Ella Fitzgerald, Mahalia Jackson, Peggy Lee, Frank Sinatra, Pearl Bailey and many more. FREE ESTIMATE. To buy, consign or sell an Emmy Award, please contact (310) 440-2982, email Nate@NateDSanders.com or go to http://www.NateDSanders.com.